"The winery of Cantalupo is the property of the Arlunno family, who have long been vineyard owners and grape growers in the beautiful rolling hills of Novara, tucked to the north of the Po River valley and south of the Alps. These are officially the back roads of Piemonte, but as such are great hunting grounds for superb wines that offer outstanding value. However, while the region that includes Ghemme, and its slightly better known neighbor, Gattinara, is not a particularly well know today, its historical wine-producing roots are deep, as there is evidence that grape cultivation in this area predates the Roman empire. The climate here is not dissimilar from that around Alba where the nebbiolo grape reaches its apogee in the wines of Barbaresco and Barolo, with warm summers and foggy autumns allowing nebbiolo to again produce lovely wines. Located so close to the alpine peak of the Monte Rosa, which is the second highest mountain in all of Europe, the soils of Ghemme are not rich by any stretch of the imagination, and the corresponding wines are elegant and medium-full in style. In this area the nebbiolo variety is called spanna in the local dialect, and most often is blended with a small percentage of other local grapes to give Ghemme its unique and compelling character. Officially Ghemme must be made up of a minimum of sixty percent nebbiolo, with other traditional local grapes such as bonarda and vespolina making up the balance of the blend. The different Ghemme bottlings from Cantalupo however are made up of one hundred percent nebbiolo, as the Arlunnos choose to bottle their vespolina (which has been grown in Ghemme for five hundred years) on its own in a cuvée called Villa Horta. The style of the wines of Ghemme is not as full or powerful as the nebbiolo-based wines of Alba, as the variety here in these sunny hills produces a more delicate and ethereal style of wine, with more red fruit and spice elements, though never short on complexity or intensity of flavor. 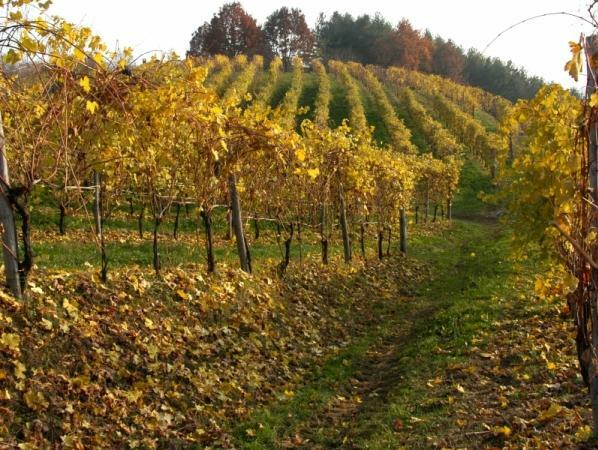 The Arlunnos have had vineyards in this area for a couple of centuries, but did not start the Cantalupo winery until 1969, when the region of Ghemme was given its own DOCG. The family now has thirty-four hectares of vineyards, most of them in the Ghemme appellation just to the east of Gattinara. The soils here are extraordinarily complex due to the retreat of the glacier through this area (the Monte Rosa glacier) at the end of the last ice age, and when coupled with Nebbiolo, these vineyards produce wines of striking soil composition and racy structure. There are four distinct bottlings of Ghemme from Cantalupo, a normale, and three cru bottlings: Ghemme "Collis Breclemae", Ghemme "Collis Carellae" and Ghemme "Signore di Bayard" that are made from old vines in the best sections of the vineyards. The Cantalupo red wine lineup is rounded out with a botti-aged bottling of Ghemme called Agamium. The winery also produces a lovely dry rosé, Il Mimo. The Cantalupo winery of the Arlunno family is clearly one of, if not the, benchmark producer in Ghemme."